excitement associated with danger or the taking of risks. a reckless or potentially hazardous action or enterprise. 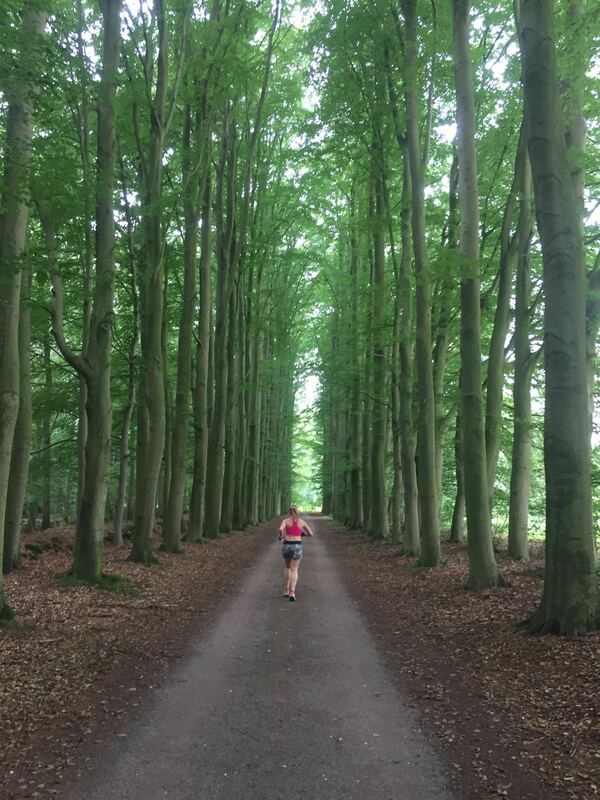 The definition of adventure defines #500kin5days for me; to run the length of The Netherlands with my dear friend Marina Ranger, wearing only our pink Runderwear raising money for Pink Ribbon Foundation was going to be the longest, most fearful and excruciating challenge we’d ever attempted. 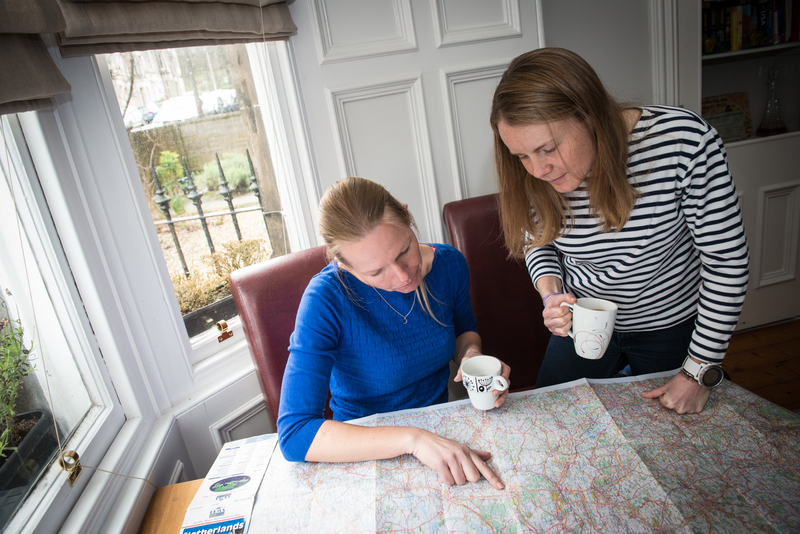 Marina and I started on this journey as we both wanted an adventure that would take us across a country, challenge us more than any race had every done before and to raise money for a charity close to our hearts, read more about this in my earlier blog here. #500kin5days was designed to push us to the limits and test our boundaries; I wanted to find out where my breaking point was. The first breaking point came before we’d even started whilst still in the planning & preparation stage with work pressures, family life and training, something had to give and the bubble burst. I was so busy in the lead up to the challenge, with having a demanding full-time job, ‘running’ Edinburgh Run Tours, my own training regime and also project managing renovation work to our house that it came to a weekend in June that I was supposed to go to London and attend an event with Marina to promote our challenge that I had to cancel and take a weekend to do some life maintenance. Never under estimate the time and effort it takes to organise a self-made adventure of any scale. Marina and I started planning #500kin5days in December 2015 and there were never enough days or hours in the week. The initial planning was around details of the route which involved following the Pieterpad, a long distance hiking trail in The Netherlands, planning checkpoints and accommodation accordingly. We had to make sure the detail of the routes were accurate and consistent enough that the support crew could coordinate the checkpoint locations. We approached a number of companies in the early part of the process and were lucky to get the support of not only Runderwear (obviously) but also Naked Runner Sunglasses , For Goodness Shakes for our all important recovery shakes every evening, Brooks Running for a donation of kit, Brandfuel for a donation to assist with expenses and Altum Consulting who donated £500 each to Pink Ribbon Foundation and to our expenses as well as supplying some branded kit. PR and social media activity was a big part of the adventure to help raise awareness of what we were trying to accomplish and of course raise as much funding for Pink Ribbon Foundation. Dr Craig Haslop from the University of Liverpool gave up a lot of his own time to work on executing a PR plan with us, ensuring we had a good media presence ramping up to the start of the adventure and post event. Marcin and Lukasz from Smartfilm Productions spent a lot of time prior to the event shooting a crowd funding video and then spent the week with us in The Netherlands filming all the action, and now face the unenviable task of editing and putting together a documentary. Special thanks to the above companies, we are forever grateful for your support. D-Day the 27th July came around rather quickly and before anyone knew it we were standing at the start of the Pieterpad ready to run 100km! It all felt a bit surreal and both Marina and I were lost in our own thoughts of how we were going to manage to complete this crazy adventure. Standing there at 6am in a tiny little Dutch village wearing only our pink Runderwear we both started to feel rather exposed and vulnerable. 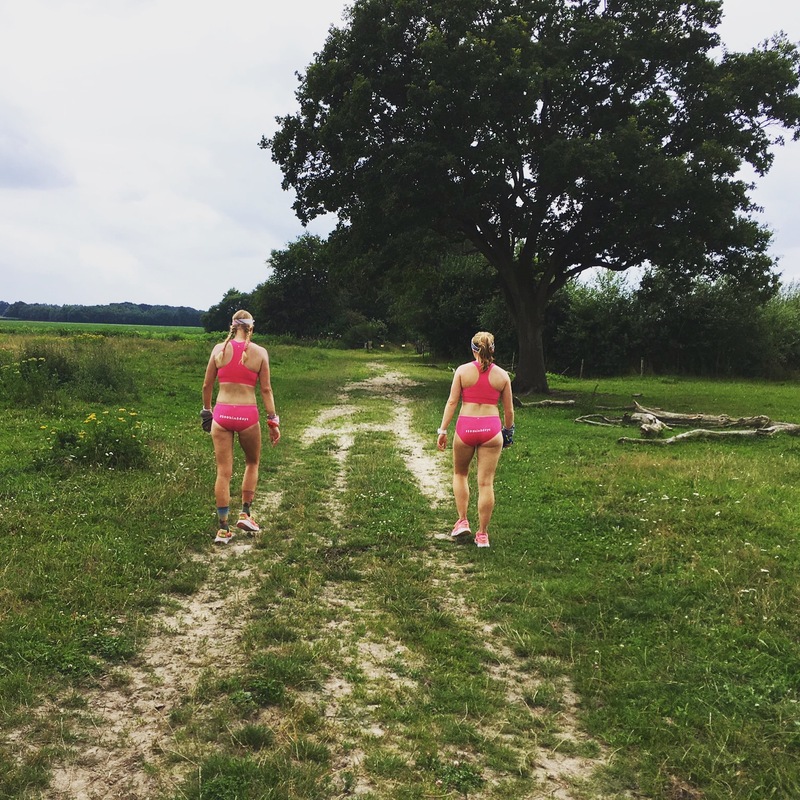 Quietly and without much ado we were off and our inhibitions started to drop about the fact that we were only in our underwear as we discovered our strength in our running and we were soon chatting away and the miles ticked away. 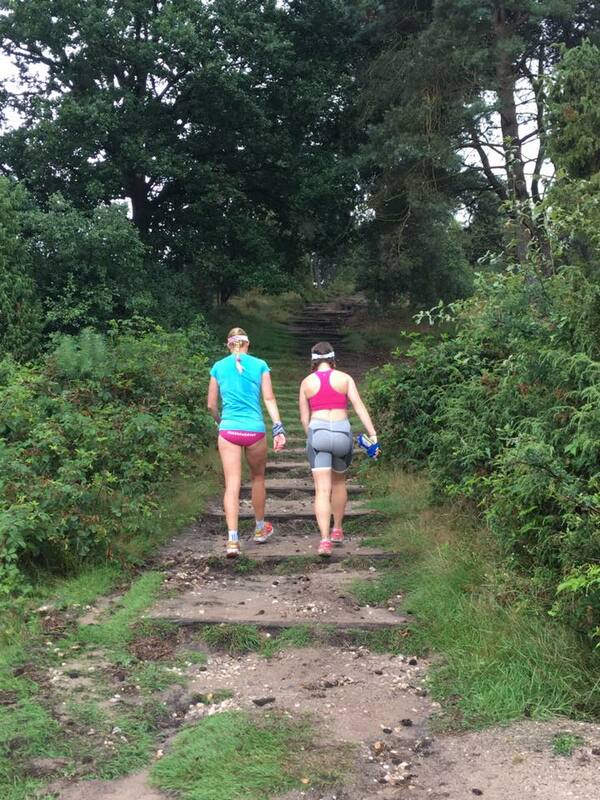 Possibly too much chatting as we managed to go off route before the 1st checkpoint! It was frustrating getting lost the first time but we were fresh and full of energy so it didn’t bother us but the 2nd time really mentally challenged us, it was at the end of day 2 and we were tired, in the middle of a forest feeling like we were going around in circles a bit like Blair Witch project, it was about to get dark and we had no head torches with us so we were starting to get very worried and scared, needless to say we were quite snappy to our long suffering graveyard shift runner, Suzan (apologies accepted after being fed and watered of course). The well scheduled routine of each day included the crew getting up early at 5am to prepare breakfast and ensuring everyone knew what their roles were and what to expect at each checkpoint. It was a great mental relief and a real motivational lift to see a friendly face every 10km and we looked forward to checkpoint 5 (lunch) every day with such enthusiasm to see what surprise location and treats Joerie (Camp Daddy) had in store for lunch, though we were limited to a 30min break each day to ensure time didn’t get way on us too much. Checkpoint 5 lunch & war zone! Each day was similar in the fact that we’d start the early morning sluggish but generally have a great first half of the day before fatigue and tiredness would start to kick in during the late afternoon as we became progressively slower. It was very difficult coping with the lack of sleep & recovery time as we were spending 15-16 hours on our feet everyday, not getting to the hotels until 10:30pm so by the time we ate, showered and got into bed it was past midnight. 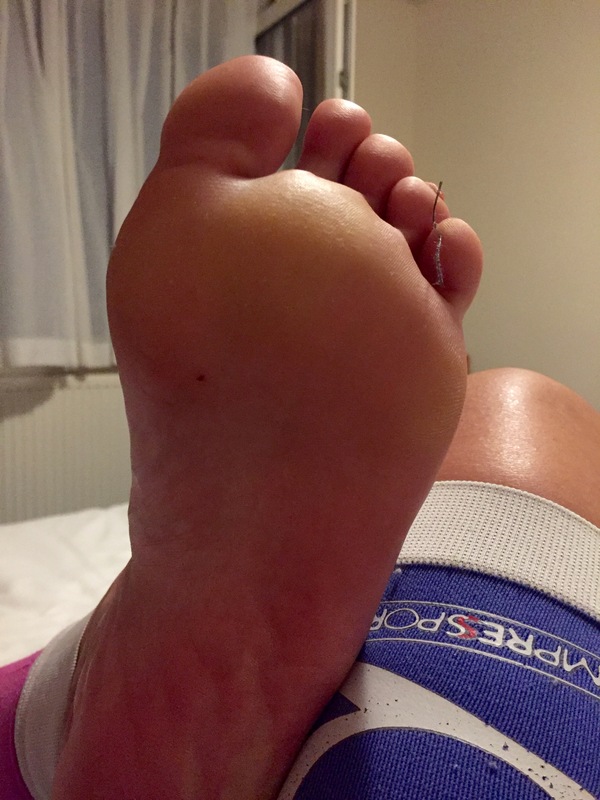 Sleep doesn’t come easy when your feet are throbbing, legs are aching and twitching and the alarm would sound at 5am and we’d have to get our swollen feet back into our trainers. By day 4 my feet were just a big swollen mess so I was really pleased with my decision to go a full size up on usual sizing and even more pleased I’d gone with Hoka Cliftons that were so cushioned and I ran every step of the way in them. Aside from exhausting tiredness and swollen feet, and my one blister; I suffered terribly from chafing under my arms of all places. My running technique keeps my arms close to my body and the rubbing caused chafe upon chafe which got so painful I ended up having to wear a shirt, I couldn’t very well not finish the challenge because of my underarms! My legs were eaten alive by the very hungry Dutch horse flies, they delivered a terrible bite and would develop into huge red marks that itched like mad! Apart from external issues my body handled the stress very well, my legs were tired but I developed no injuries which I put down to a good program of strength and conditioning. My husband Dion, who had just returned from a 250km race (see more http://www.findinggobi.com) always says that with multi stage events everyone is going to have a bad day, it’s just about minimising how bad that day is and how it impacts you. This for me was day 3, 270km in. I was so tired I was sleep running and having just gotten over half way of the challenge, the end seemed like a very long way away. We spotted our crew Rhianon and Suzan holding up a sign saying ‘You are Superheroes’ and we both broke down in inconsolable tears for a good 15mins but then somehow we got up and got going again, a special thanks to these 2 superstars for mopping up our tears and somehow giving us a hug and a kick up the bum at the same! We would not have completed this challenge without these two. With one of Rhianon’s supporter signs making us smile! My day of total inspiration came in many forms on day 4, we had been joined by Dion and I felt rejuvenated and it was like I had a complete bag of happy energy. I also wonder whether my body had adjusted to the newly established way of life; run, eat, sleep & repeat! At the same time I was having a surprisingly strong day Marina was having a really tough time and I think she cried most of the day with her partner James carrying her to the hotel room at the finish. I was in awe of her sheer determination, struggling through the immense pain of a sore knee mixed with exhaustion she just kept going, swallowing the tears and pushing on. That is why I wouldn’t have done this challenge with anyone else, I know Marina has this dogged determination to never give up. The beauty of The Netherlands surprised me. The Netherlands are known for being pretty, but I hadn’t expected so many stunning routes along the Pieterpad. Originally I had expected a lot more cycle paths and bitumen so was pleasantly surprised to find trails of sand, gravel, stunning forests and tree lined paths that helped keep our minds occupied looking at the scenery. I was also rather surprised to find that The Netherlands have hills, trust me there are hills. 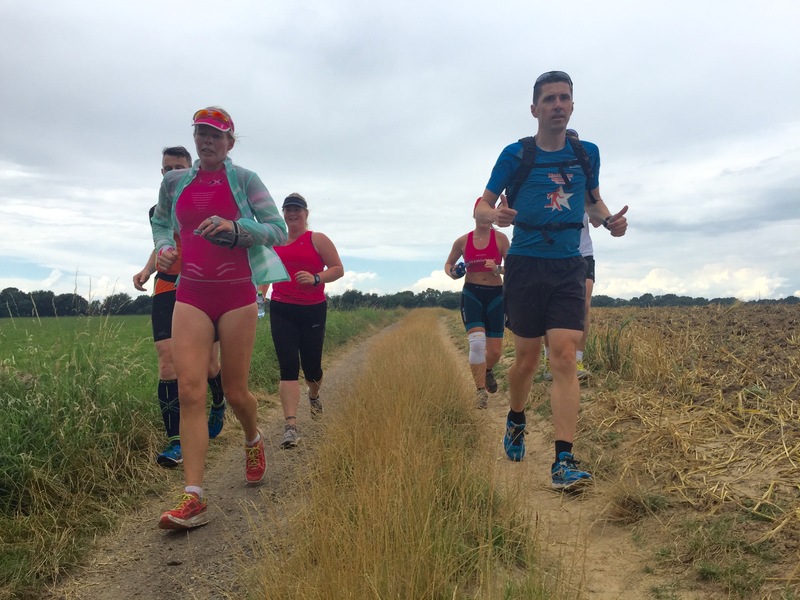 Along the way support was well received from people such as Kiki, who runs Nijmegen Running Tours and also gave us a massage at the end of day 3, Ramon just outside Maastricht who ran the last 30km with us and Rahoul from Maastricht Running Tours who took us through the last 20km. We finished in the sunshine in Maastricht to the applause of our amazing support crew and celebrated with pink bubbly in plastic cups. Ultra running adventures are not glamorous and unless you are an elite runner; the finish line is often very quiet and only inhabited by those that love you, and that is ultimately what matters most. I don’t run these types of challenges for the plaudits, I do it for me, to have to dig deeper every time and uncover a more resilient self and in that I find my happiness and my success. We raised a phenomenal amount for Pink Ribbon Foundation, currently our donations are sitting at £7,573 (you can still donate here) and we have raised a further £676.10 through the 10% donation from Runderwear for all the sales of pink Runderwear during our campaign. 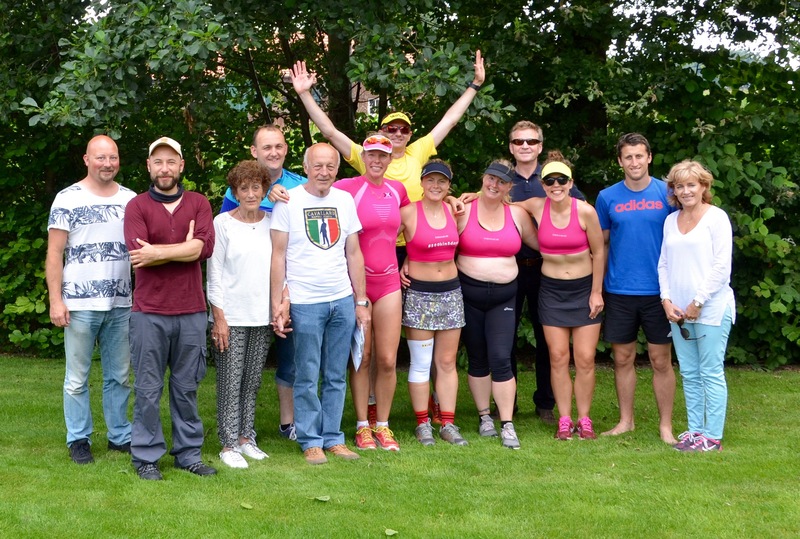 We are really pleased with all the fantastic support and donations we received during our journey and want to say ‘Thank you’ to each and everyone of you for all your varying types of support and donations along the way, both Marina and I, and of course the team at Pink Ribbon Foundation are eternally grateful. 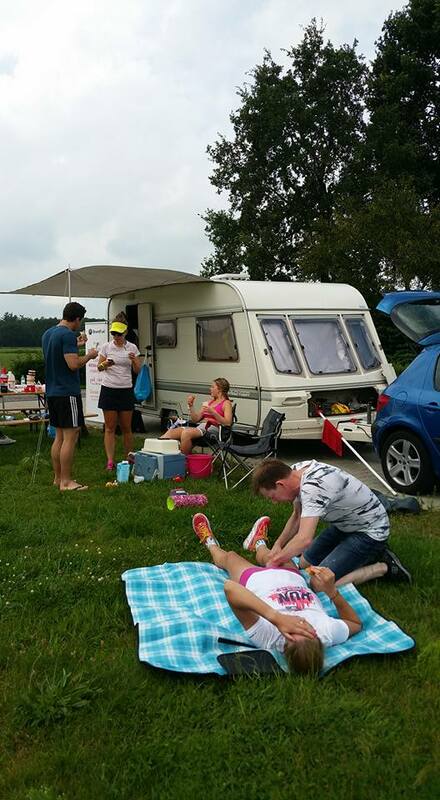 This adventure would not have been possible without our support crew, they are true superstars! Hats off to anyone that completes adventures fully sufficient as we are forever indebted to our crew for looking after us so well. The A-Team crew consisted of (in no particular order) Suzan & Joerie Haring (my cousin & husband), Tad & Rina Jantjes (my Uncle & Aunt), Patrick & Angela Ranger (Marina’s parents), Rhianon West (Friend for life), and of course Dion Leonard & James Booth (our respective partners). Within the crew we had a car with caravan and 3 other passenger vehicles along with a bike and trailer for the film crew, Marcin and Lukasz from Smart Film Production who were on hand to film all the action. Without a shadow of a doubt this was hands down the toughest challenge we have ever completed; filled with tears, exhaustion, pain and of course some laughs too.